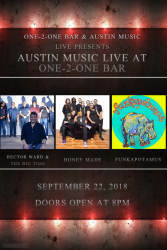 One-2-One Bar, Austin Music Live & Xumo TV are joining forces to share local Austin music with the rest of the country! Join us for a great show featuring Hector Ward & The Big Time, Honey Made & Funkapotamus! These shows will be live tapings, so please help us fill the room for these shows and let everyone in the United States witness how ATX supports local music first hand!